Experience a lifestyle market tomorrow at the Caravan. Sadly I can not attend the aforesaid event due to prior commitment. It offers creations on beauty, fashion and home. That's an all in one market, right? 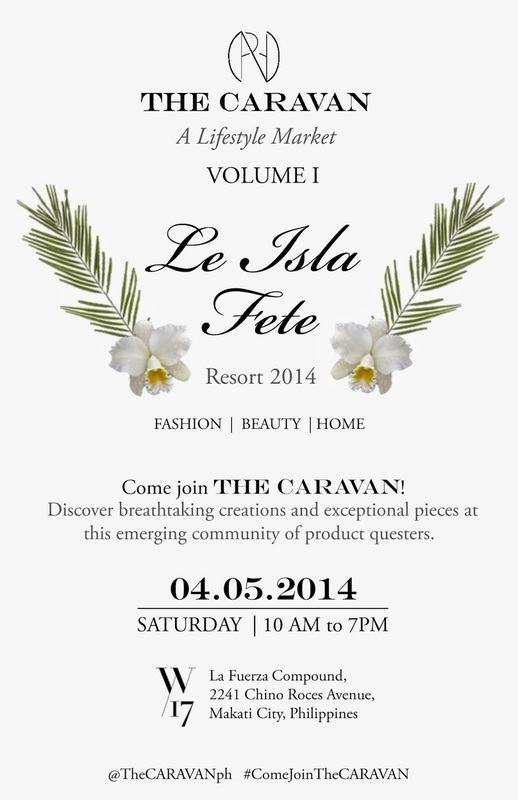 This summer, enjoy your lush, tropical resort getaway with essentials from The Caravan: La Isla Fete. Featuring an eclectic mix of carefully chosen brands in Fashion, Beauty, and Home, the unique lifestyle market comes to town on APril 05, Saturday from 10 AM to 7 PM at W17 La Fuerza Compound, 2241 Chino Roces Ave., Makati City, Philippines. Featuring Filip + Inna, Quiver, Brown Belly, Two Chic, Myth, Thread365, Bensimon, Praiaz, K Way, Butter London, Cbeauty Universal Beauty Oil, The Urban Alchemists, Sparrow, Kiele, Kotur, Lagu, Renegade Folk, Rivieras, Saxum, Lustre, Melograno, Stockton Row, Nicole Whisenhunt, Sam Cologne – Azul, NCLA, VINO2G0, Tilka, Naked Sun Swimwear, and more! #ComeJoinTheCARAVAN and be a part of this new wave of cult shopping! I received two goodies that will be availble at the Caravan. First is the J&C Super Clean Solutions. I have been seeing a lot of reviews about this brush cleaner. Thankfully, I was given a bottle to try. It smells so clean and refreshing. When I became a professional makeup artist,a brush cleaner suddenly became a necessity. This is must for make-up artists and enthusiasts alike, J&C Super Clean Solutions is a specialized make-up brush cleaner that removes all traces of dirt and grime. Effective and long-lasting with a fresh spearmint scent it's the perfect essential to add to any make-up kit. Another goody I received is a Kiele Anti Mosquito Cologne. Ohh My, if you have heard about certain places having a swam of mosquitoes, one of the places is where I live!! Can you imagine my dilemma of incurring mosquito bites every now and then? We have tried dozen of tricks and we are running out options to get rid of these mosquitoes. I do not like mosquito repellant lotions because they feel so sticky on the skin. This cologne right here is an answer to my prayer! It smells very nice (imagine baby colognes like Nenuco or Angel's breath). Kiele Anti-Mosquito cologne combines a refreshing scent with essential Citronella and Neem oils to keep those pesky insects at bay. Spray it on and enjoy la bonne vie with this unique fragrance. Godbless everyone! I seriously miss blogging and writing about beauty. I promise to get back on track.